Kate Taylor is a professional fishing guide who leads angling excursions all over North America and beyond. She and her partner Justin Crump own and operate Frigate Adventure Travel, which specializes in organizing and supporting their clients as they fish some of the most iconic and beautiful locations in the world. Recently, we sat down with Kate to find out where she’s been spending her time lately, what her plans for the future are, and what gear she can’t possibly live without. Gear Institute: Hi Kate! Thanks for taking time out of your busy schedule to talk with us. Where have you been up to lately and where are you headed next? 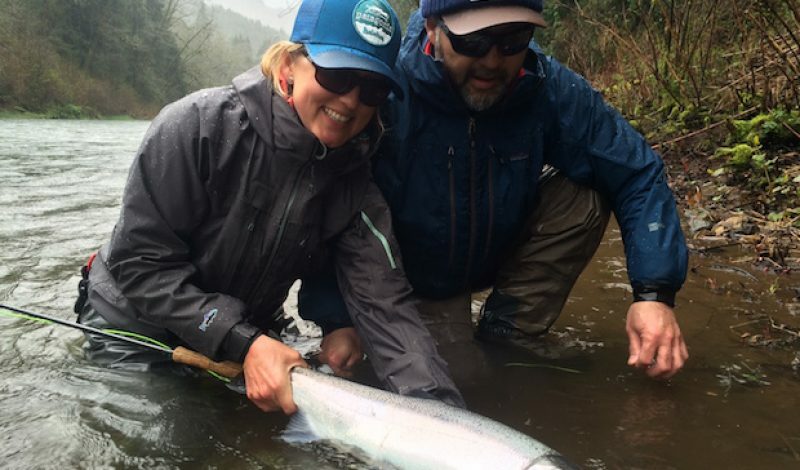 Kate Taylor: My partner, Justin Crump, and I are just wrapping up another great winter guiding steelhead on the Oregon coast. Next month we are heading to Christmas Island with guests to fish the flats hunting for Bonefish, Giant Trevally, and Triggerfish. Followed up with our seasonal move in June to Bristol Bay, Alaska to guide for salmon, trout, and char in the waters of Katmai National Park. GI: Sounds like some amazing destinations. When you’re guiding in these great places are there any pieces of gear that you carry with you every time? KT: I rearely leave home without my Fishe Wear leggings. They’re super fun leggings designed for women who fish. They offer SPF 50 sun protection, which makes them great for just about any activity. I get tons of compliments when I wear them. I also carry plenty of Patagonia Provisions Buffalo Jerky. I snack a lot and this jerky is delicious as well as responsibly raised and harvested. I usually take Nehalem Beehive Lip Balm with me as well. It’s a bee balm for my lips that is locally harvested and made by an organic farmer here in Oregon. Oh, and a reusable water bottle too. I can stay hydrated and avoid buying plastic products at the same time! GI: You’re fortunate enough to have several great sponsors too. What are your favorite pieces of gear from them? KT: I love my Costa Inlet sunglasses. They fit perfectly under a ball cap and have a great lens for seeing into the water and protecting my eyes. I also carry my Bobs Tactical Scissors from Rising Tools with me on my fishing trips. I use them for everything from releasing fish to cutting line. The quality is unparalleled as well. My last pair lasted five years! Patagonia Women’s River Salt Jacket is another one of my fave’s. Finally, someone made a technical rain jacket for women that is functional, durable, and fits perfectly. If I leave this at home, it’s guaranteed to rain! 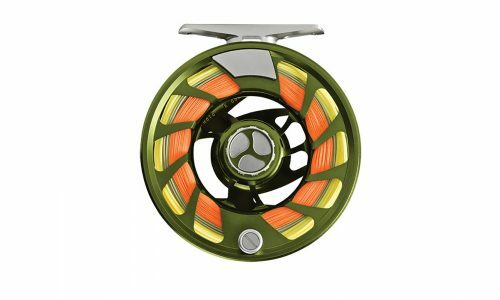 Whether I’m fishing in freshwater or salt, I want to know my reel is going to stand up to whatever strikes my fly. That’s why I use the Loop Tackle Opti Strike reel. There is never a doubt in my mind when I’m fishing with Loop. Finally, I use Fishpond’s Westwater Boat Bag as well. 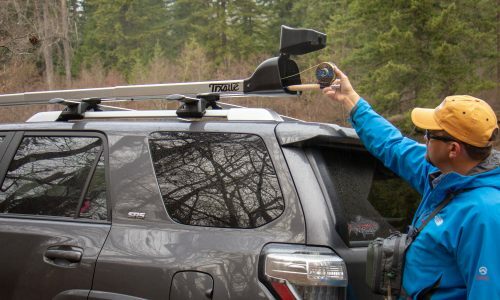 It holds all my gear, keeps it dry, and is easy to access. What more could you ask for? GI: Do you have any special packing tricks that you can share with our readers? KT: I try to roll all of my clothing for my travel trips in a pack like Fishpond’s Westwater Roll Top bag and carry it on the airplane. That way I can unpack all my gear and then use the bag to carry an extra rod, my fishing stuff, and a camera to throw in the boat and it all stays dry. In turn, I use a hip pack like Fishpond’s Westwater Lumbar pack as a “purse” to carry my wallet, phone, and a good book on the plane then I can use that for hiking the flats to hold a fly box, extra leader, and a water bottle. I’m always shocked when women compliment me on my travel purse! 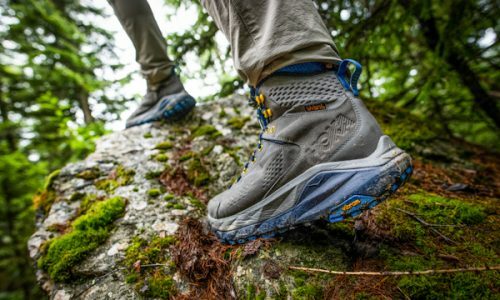 GI: Are there any trends from the outdoor industry that you’re excited about right now? KT: I’m excited to see so many women entering and emerging in the world of fishing. This sport has such an even playing field for all genders and the ability to instill confidence and inspiration. And because of your exposure to the natural world when fishing, it’s a great building block for becoming active in protecting the wild places important to not only ourselves and the wildlife but our communities too. GI: Thanks for sharing your thoughts today Kate. Any last minute message for Gear Institute readers? KT: Please find out where your drinking water comes from and learn how those places need protecting for the health of your community and our world at large. 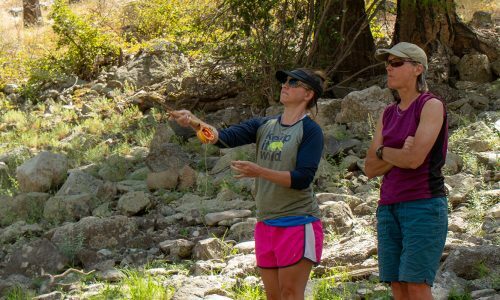 Becoming an advocate for your watershed can help not only the fish and wildlife, but can reduce the climate change issues we are facing by preserving those forests and keeping watersheds cool.